A series on earning money wouldn’t be complete without me talking about garage sales — especially since I’ve sort of garnered a reputation for having smashingly successful garage sales. After many years of hosting and earning thousands of dollars from garage sales, I’ve learned much through trial and error. I have an ongoing Garage Sale Stash. When I come upon something we no longer need or use and I don’t know anyone to pass it onto, I stick it in a box in our garage. Once a box fills up, I start another. And another. Without much effort at all, by the time it’s the month of our annual garage sale, I usually have at least 8-10 boxes of stuff collected. A successful garage sale does not happen without organization. At least a week before the sale I go through my home from top to bottom and clear out clutter. At least 2-3 days before the sale, I take an afternoon to price everything and organize it. And then the day before the sale, I devote a few hours to final organization, posting an ad on , getting the cash and signs together and so forth. Do not wait until the last minute to pull off a garage sale. Either it will flop or you’ll run yourself ragged–or both. If you’re in a new location or you’re new to hosting a garage sale, I’d suggest that you start getting organized at least 3-4 weeks in advance. ::How are you going to display items? Do you need to borrow or make a clothes-rack? ::Do you have enough table space? If not, check and see if you can borrow tables from friends or put together some makeshift tables out of plywood and boxes. ::What signs will you be using and how many do you need? Where will you be displaying the signs to best direct traffic to your home? Drive the routes people will be coming and decide on these locations so you’re not scrambling the morning of the sale. ::Who is going to put the signs out the morning of the sale? Designate someone for this ahead of time and let them know specifically where to place the signs. ::How much cash should you have on hand and how will you keep it in a safe location? ::Do you need to purchase a license for running a garage sale in your area? ::Do you have enough help? One of my best “secrets” for success when it comes to garage sales is that I never do them on my own. I always find friends or family to team up with. Not only does this arrangement mean you have more stuff to sell and more variety in sizes and types of things offered, it also means you have more help. Divvying up the responsibilities between 3 or 4 people makes a garage sale much more manageable. Plus, it just makes it more fun when you’re doing it with friends and family! If you want to have a garage sale that flops, pick a location which is off-the-beaten-path and hard to get to. That’s a surefire way to lose a lot of business. Don’t live near a busy intersection? Well, look for alternative locations like a friend or relative’s home. This is probably the key to our garage sale success. We live right between two very heavily-trafficked streets. We put up some good signage and the crowds descend! I don’t advise planning a sale in the freezing cold Winter or the blazing hot Summer. Choose a time of the year when the weather will be very pleasant and try to check the weather forecast ahead of time to make sure rain is not expected when you’re planning your sale. In addition, find out what days of the week are best for yard sales to run in your area. When we lived in Kansas City, I found people usually only held sales on Friday and Saturday. However, where we live now, Thursdays are a big yard sale day and seem to garner the most traffic. 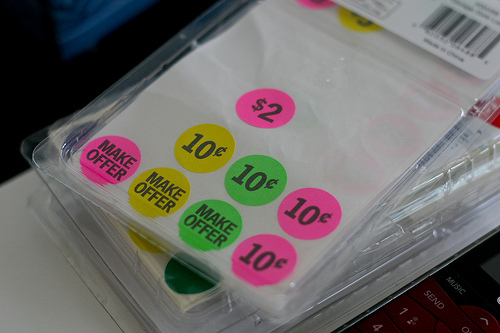 It’s easy to want to just stick a big sign on a table saying that everything on that table is a quarter, but, in the long-run, it is much more efficient to go ahead and put price stickers on everything. Instead of having to make up prices on the spot, people will know exactly how much something is. In addition, some people are too shy to ask the price of an item, so you’ll lose a sale if an item isn’t marked. I’ve found it’s easiest to invest the few dollars it costs to buy pre-priced stickers for most of my items as this makes pricing a snap. I try to have variety in pricing with plenty of $0.25 or less items. I’ve found that when people pick up one thing to buy, they are more likely to pick up other things as well, so have lots of $0.25 items and it might help you sell some of your larger-ticketed items, too! Since we pretty much always have multiple families involved when we run a garage sale, we just mark initials on all our price tags and then keep a tally sheet in a notebook as things sell. It adds a bit more time when customers are checking out, so it’s good to have at least two people working the money table–one to keep track of the tally sheet and one handle the money and making change. When I go to a garage sale, I expect to pay yard sale prices. Unless something is brand-new with the tags on, I am not going to pay more than a few quarters for it, if that. When I am pricing my own items to sell, I always try to price things at what I feel would be a good bargain if I were buying the item at someone else’s garage sale. I’d rather price something on the low end and have someone actually buy my item, than to have 25 people pick up the item and put it back down on the table because it is too expensive. The marketing of your sale is usually the number-one factor in how well your sale does. You can have great items, great prices and a great location, but if you don’t tell people how to get there, they won’t find it on their own. Put some time and effort into making a number of quality, clearly-readable signs which you put in conspicuous places to easily lead to your home. The brighter, bolder and bigger the sign, the better. 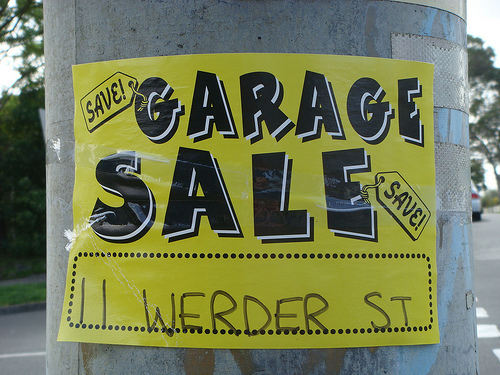 I have also found to be the most-effective marketing tool for advertising a garage sale. And did I mention it’s free to advertise on Craigslist? I usually advertise the day before the sale and then re-post a revised ad each day of the sale. The more details you can put in your ad, the better. Tell specific items, specific brands, and specific sizes. When people search for items on Craigslist, if they are looking for what you’re selling–even if they aren’t looking at garage sales–your item will pull up in searches for them. So the more descriptive you can be in the listing and title, the better. Of course, don’t write a book; just focus on your hottest sellers. And please use proper grammar and spelling. Sometimes, it’s the little things that make a big difference! Things are usually pretty picked over by the last day of the sale. That’s the perfect opportunity to get creative and hand out rock-bottom bargains! We found that running “Fill a Bag for a Buck” is extremely effective. In a recent garage sale, we got rid of around 25 bags full of stuff in a few hours by doing this. We’ve also done it where everything was half-price the last day. Or, if we have quite a bit of stuff left and we’re feeling ready to close up shop, we’ll just say that everything is free the last hour. 10. Don’t forget the cookies and lemonade! What better way to teach your children entrepreneurial skills and let them earn a little money in the process than to have them set up their own little cookie and lemonade stands at the sale? Or, if it’s cold outside, try selling hot chocolate, coffee, and fresh cinnamon rolls. One yard sale, we even set up a pancake griddle and sold pancakes hot off the griddle on Saturday morning. Baked goods–like homemade cookies and bars–sell extremely well at our garage sales. In fact, my younger brother made around $100 from selling cookies at a recent garage sale! What are your best tips for having a great yard sale? I’d love to hear! Yes! I run as fast as my asthma will let me if I see sellers smoking. We love manning our lemonade stand. Love this series. Thanks, Crystal! I confess garage sales wear me out, lol. I agree they wear me out, sooo much work. We have to take our things in and out. It would be great to have a empty garage to put it in and just open up and set some things out!! We just did one and didn’t do well at all. We said never again!! I love to work my yard sale like a store clerk all day long. I make sure things stay in neat piles. Put the most attractive stuff to the front. I great people when they walk up to the sale. If they seem friendly and wanting to talk I ask them if they are looking for something specific and then help them find it if I can. I also love upselling for instance if one person has a pair of pants in their hands I will say “hey I have a shirt that looks great with that top let me find it for you”. However if people seem to just want to drift through the sale without talk I let them. The key is to remember your yard sale is your store front, work it like you would if it was retail. When we did multiple person/family yard sales, we, too, did inidials on the price tags. Then we just pulled the tags off and stuck them neatly in a tally book – different columns on one page until full and then continue on a new page. The actual “tally” took place at the end of the sale, rather than during. Didn’t take quite as much time during check out and made it easy to double-check the math too! Love these ideas Crystal. Thanks for the great post! One of the best things I’ve ever done is had a garage sale. I realized how much I was spending and then how much it was worth. Best thing that I’ve done for a long time for reevaluating my budget! – One lone sign at the entrance to a large development, and no other directional signs. I’m sorry, but I don’t know your neighborhood and have no idea how to get to 123 Mockingbird Lane! – No prices. This seems like a new thing. I’ve been to several sales where nothing was marked, and you were expected to ask the seller about each individual item. Also, there’s a new trend toward hanging one large sign with prices marked like .50 shorts, $1 dresses. This kind of pricing can make for some really great deals if an item is particularly nice, but it means I have to constantly refer to the sign, and it doesn’t take into account differences in quality and condition. – Sales with multiple sellers who aren’t all present. If you are sharing a sale but can’t attend, make sure others there know if you are willing to negotiate prices. And nothing worse than finding a garment with no price tag, and no one can tell you what the price should be. – Clothes laid out on a tarp on a driveway/garage floor. Borrow some tables! I do not want to stoop down to sort through clothes, and it tells me you might not care for your belongings as I would. – Smoking during the sale. Yuck! I’ll drive right by. – Not knowing who the seller is. Place a chair next to a table and park yourself there. If I don’t know who I need to pay, chances are I’ll just put the stuff down and walk away. – It’s fine if you chat with your friends or neighbors or text when things are slow, but I’m going to leave if I feel weird about interrupting you to pay. And if you take a call and I approach you – hang up the phone! Some very good thoughts Whitney! Honestly, I have had as good of luck doing a one day sale on a Saturday with a few friends than all weekend. All weekend is terribly exhausting, but doing a one day sale and putting that on your sign is a huge draw. My mom who is an avid Saturday garage saler will not bother with a Friday/Saturday sale. I had a Saturday only sale about 3 years ago and made over $300 in one day. By the end of the day there wasn’t really anything good left! When pricing things I look at it this way, assume there is 1 buyer for each item you have, so price it right so that person doesn’t put it back because it’s priced too high. Oh, and something else I do to save time is price my items as I add them to my boxes so I don’t have to spend hours pricing things later. I agree with the pricing as you go method. I have done this for a few months along with following the other suggestions Crystal offered in her book The December212012’s Budget. I had a two day sale this week with a few other moms and made an easy $200! What didn’t sale was mostly summer stuff that most likely no one wanted to store over the winter. I really didn’t either, but it’s still good stuff, so I just returned it to my boxes marked “yard sale” and it will be ready to go in the spring when buyers will be interested. These are all great comments. One thing that I look for as a buyer is having your stuff closer to the street! If I drive by and can’t see anything that catches my eye, I won’t stop. But if I’m driving by and see something interesting I can’t help myself–I must stop to investigate. Also ask your neighbors if they want to join you. Every time my neighbor has a yard sale I always wish they told me so I could pull one together too. More than one sale attracts more buyers! We just had a very successful garage sale (in fact, decided to have another one the following weekend since everything was out anyway) because we advertised it as an Adoption Sale (we are trying very hard to get our adoption expenses paid off) and several commented they saw our ad. Pricing the items, marketing because we live out in the boonies, and offering items at low but reasonable prices were key. We made nearly $1200 for 12 hrs of garage sale. When we explained to people why we were having the sale, few tried to negotiate and one lady actually said to keep the change. I agree garage sales are hard work! I also collect things year round that I store in my laundry room. I try to price things as I put them in the boxes so that it’s not as overwhelming when it’s time to set up. I usually make around $400.00 and have a decent load to donate to Goodwill. It definitely helps with reducing the clutter! Just had a great yard sale yesterday using most of these tips. We made $600 and my in-laws set up with us and made over $60. It always amazes me what people buy! The items you think will go first thing often are left & items I was almost to embarrassed to set out/ask for $ were snatched up right away. I had two old concrete flower pots that were chipped & had paint flaking off of them. They were left by the previous owners when we moved into our house 11 years ago. I told hubby to throw them away. He put them in the yard sale and they were sold almost right away. My tip would be to put it out…you never know what will sell! So for my area we have an awesome website to post yard sales, etc other than craigslist. Its on the main news stations website, If you want to make extra cash just pick up free stuff that people post and free items people don’t want to take to donation after their yard sales and you can make tons of money that way! I have made over $600 doing this periodically. At the end of the year I do donate for tax purposes just to get most of the stuff that I wasn’t able to sell out of my stash. Next spring I will have new again anyways. Also to note I hate using tags, tap, etc for pricing, it takes up too much time. I would if I was having the yard sale with more than 2 people. Also tagging items as you box them can leave sticky marks and stains from the glue. When I go yard sale shopping I don’t mind if there are tags but either way I will be negotiating. When their are tags I will peel back the tap to make sure it won’t be damaging the item. Great advice on organization and signs. Also on signs you might want large, bold, black lettering on a bright background with large bold arrows. This I have found is the best way to get people’s attention. I always us painters tape to mark prices. I never have a problem using it and it comes in a couple of colors for multiple sellers. One roll has lasted for many sales. Also I would recommend a carpenters apron to hold your cash. It keeps it on you and then you don’t have to worry about it walking off. Also great when pricing to hold your stuff.